Awesome! 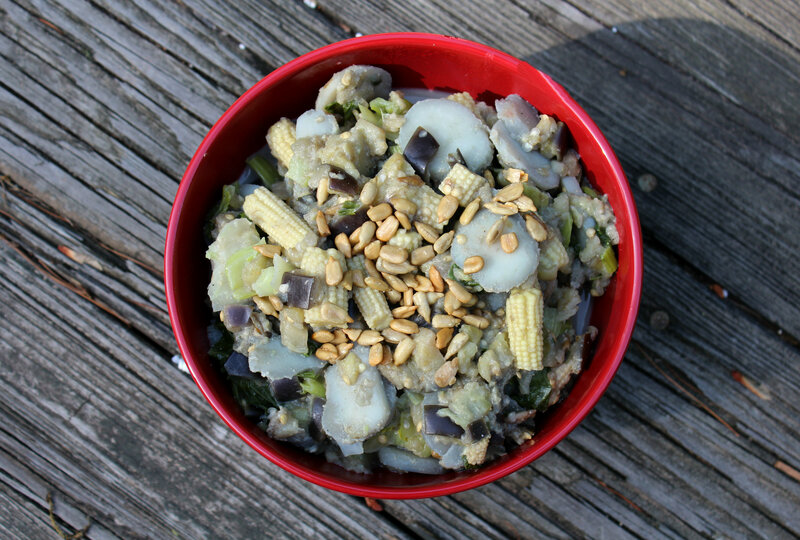 Thank you for sharing this healthy and delicious Sunflower Asian Eggplant recipe with us at the Healthy, Happy, Green and Natural Party Blog Hop. I appreciate it! Sounds great. We’d love you to add our link party to your link up list 🙂 Thanks for linking up to Sweet and Savoury Sunday, stop by and link up again. Have a great day!! Its there like it always is! It is quiteta bowl and quite a meal. Thanks for bringing it to foodie friday. 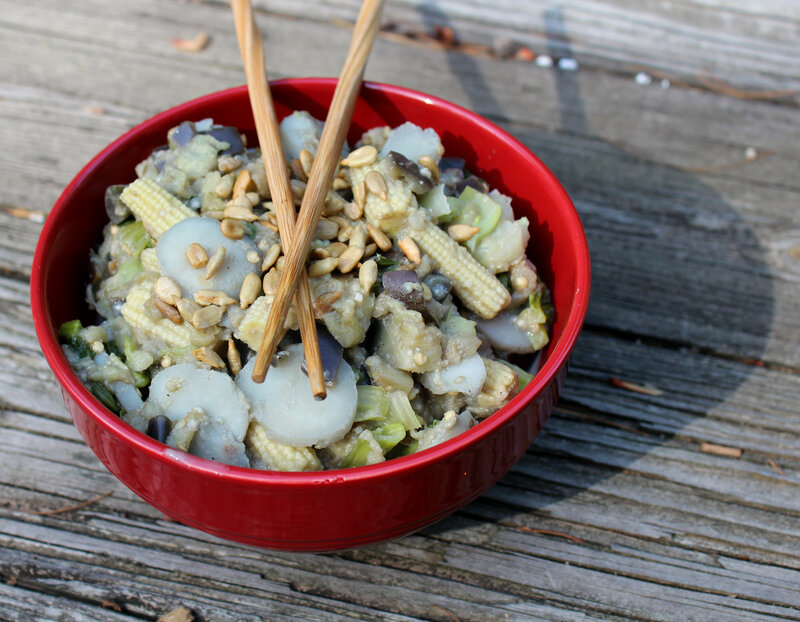 I ADORE water chestnuts but I haven’t eaten them in forever, same goes for eggplant! I MUST change this, ASAP! Those baby corns though, scare the CRAP out of me! 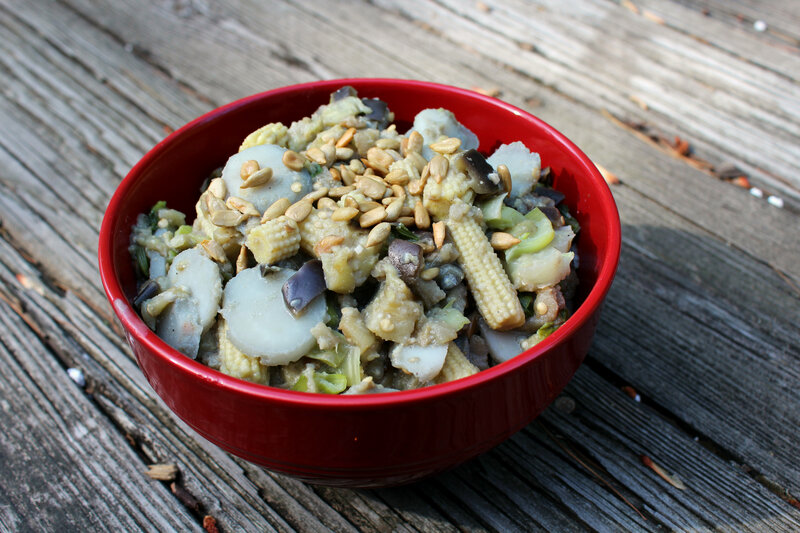 As for baby corn though….love them always! 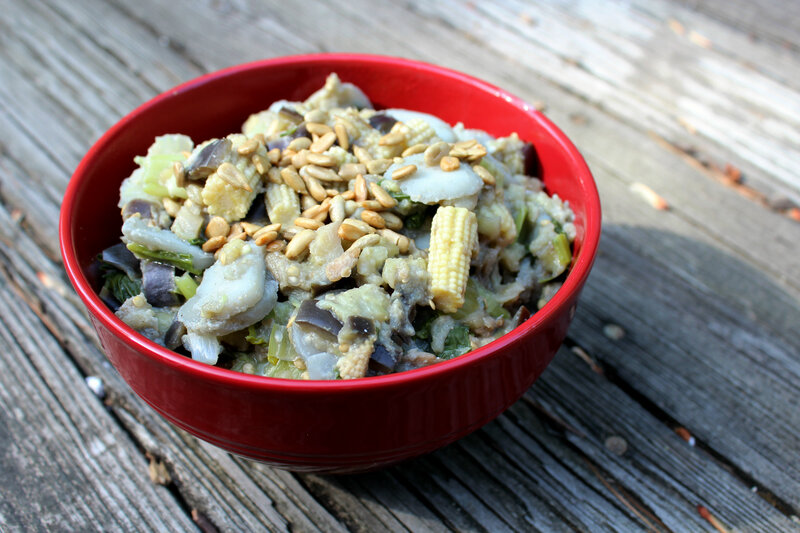 I don’t LOVE eggplant, but how you’ve prepared it looks delish! You won’t even notice your eating eggplant! That’s such a lovely story! I totally understand you’re delighted with your bowl. Awww, I love this! I DEFINITELY have a favorite dish–a turquoise bowl that I picked up at a secondhand goods store for $2. It’s the absolute perfect size for oatmeal, smoothies, salads, hippie bowls, EVERYTHING. And it doesn’t get hot in the microwave, either! That recipe looks incredible, by the way. I’ll plan to whip up a batch of that sauce for dinner tonight! Special bowls make eating so much fun, haha! LOVED the story of the bowl. Loved the happy ending too haha! I also have a couple of cups that I absolutely adore. And if I ever have to share them with anyone else, it has to be absolutely someone who means a lot to me haha! Weird? I know! Yay for eggplant 🙂 Happy eating! This is so creative and unique, I love it! I can totally see how sunflower sauce would be a delicious compliment to eggplant! I wanted to do something different with the seeds so an Asian sauce it was! 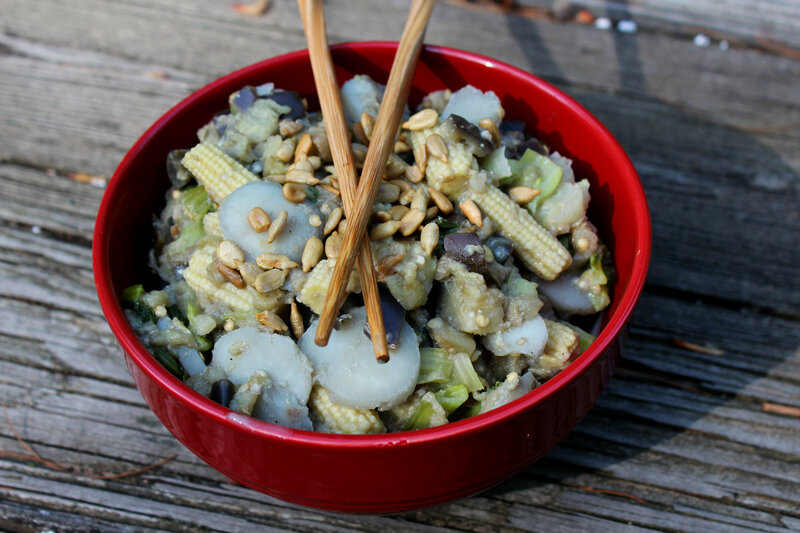 I need to snag some sunflower seeds for salads and topping beautiful bowls like this! Yum! I have half an eggplant to use up so I will definitely be trying this sauce. Happy Wednesday! yum!! i love eggplant but never know what to do with it! maybe my husband will like eggplant if i make it this way! Oooh great idea….well actually multiple great ideas….I was looking around target for blogging props yesterday, but couldn’t justify the price! This would be great though, and love the idea of the dish….especially as you can have it on a number of carbs! Yum! Great runner recovery food here! You’d be surprised what you can find at the dollar store! I did just buy tons of new dishware at BB&B, but I only picked the clearance stuff so each piece was under 5 dollars…and I think that cheaper stuff looked 100% better than the more expensive! It is the perfect recovery meal! 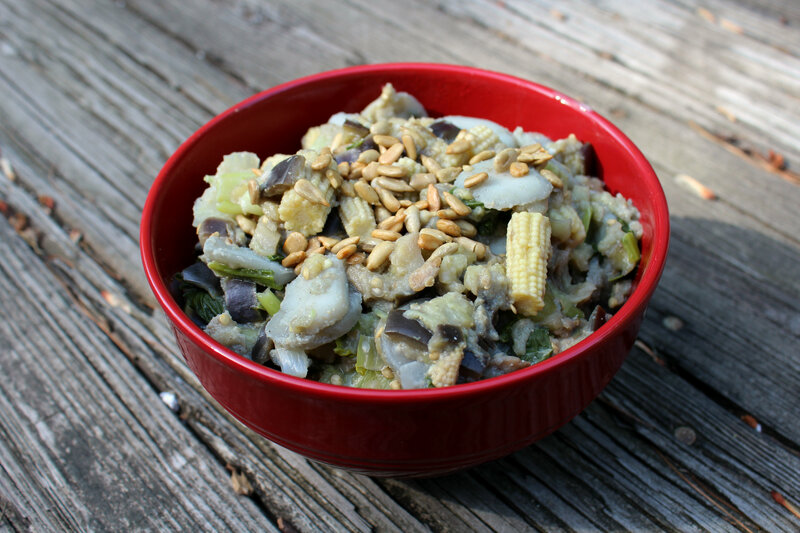 Well rounded with veggies, fats, protein, and your carb choice! I love the sounds of the sunflower sauce – really unique. O no 🙁 Well if it’s still usable, cherish it and keep it in a special “bowl-only” place! Treat that thing well!